If you’ve read my previous posts about turquoise then you know how to tell real from fake, what makes turquoise jewelry unique, and why you should consider investing in the near future. Is there anything else you need to know about the beautiful blue stone with the come-hither sheen? Well, yes. 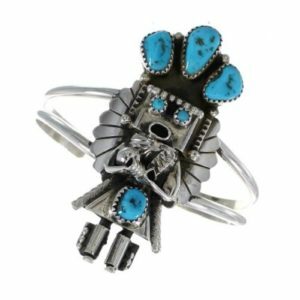 There are a few lesser-known facts about turquoise that might benefit you when you’re out on the town and see a vendor with some stunning pieces in their collection. First, many people ask me what makes different turquoise valuable or what makes one type more valuable than another. One element that may have played a role in the value of turquoise is the scarcity of the stone. If a mine with a particular turquoise isn’t producing anymore then you might have something valuable on your hands. That being said, some of the most valuable types of turquoise are Bisbee, Lander Blue, and Number 8. Similarly, some of the most valuable types of turquoise, like Lander Blue, come from what’s known as “Hat Mines.” These mines get their name from the reluctant miners that can carry all the raw material they gathered in a hat. Another thing you should know is to be weary of mines outside of the United States. There are a lot of companies in China that manufacture an imitation turquoise and use clever wording to sell it like the real deal. Always make sure you know the mine, the type of turquoise, and you’re buying from a reputable source. Finally, the future of turquoise jewelry rests with Kingman. The mine in Kingman, Arizona is one of the few ones left still producing large quantities of turquoise stones. With the depletion of the Sleeping Beauty mine, Kingman turquoise is something you should definitely look into investing in. Turquoise is a beautiful stone that has a healing aura to it. People over numerous cultures, countries, and beliefs have found turquoise holy in its elegance and stunning blue sheen. It’s a natural resource and one that artists are clamoring to use in their work. If you want to make waves for the New Year, there no better way than with some turquoise jewelry in your collection. I’ve said it before and I’ll say it until there’s no turquoise left, this gemstone makes for some of the best accessories with any outfit!